The Belted Galloway (Belties) are a breed of cattle originating from Galloway on the west side of southern Scotland more than 300 years ago. The exact origin of the breed is unclear although it is usually accepted that the white belt that distinguishes these cattle from the native black Galloway cattle is a result of breeding with the Dutch Lakenvelder belted cattle. It is the belt that gives them their name. Belted Galloways are primarily raised for their quality marbled beef, although they are also purchased to adorn pastures due to their striking appearance. For sheer eye appeal, no breed is more distinctive in the paddock. They have a "double coat" of hair, consisting of a long, shaggy overcoat and a soft, thick undercoat, providing excellent insulation in cold, bleak weather and reducing the amount of feed intake required to maintain body weight. The Beltie is naturally polled and when crossed with another breed, the growth of horns will be prevented. In the United States, Belties are often nicknamed Oreo cows because their colour pattern is reminiscent of an Oreo biscuit, which consists of chocolate coloured disks with a cream filling in between. 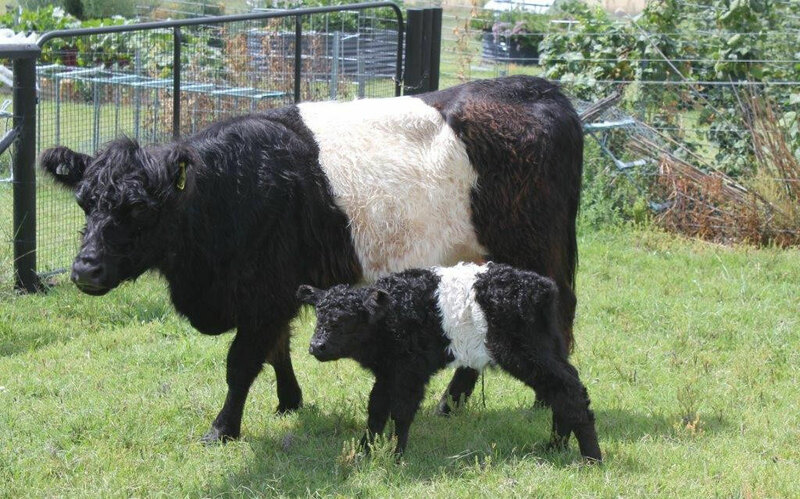 Mini Belties have all the characteristics of standard Belted Galloways but offer it in smaller animals which can be beneficial for many potential users such as those on small acreage farms. There is also a growing trend to use Mini Belties in the restaurant trade where small cuts of beef are ideally suited to meal serving sizes. The maximum height requirement to be classified as a Mini Beltie bull is 125cm at the hip as an adult and 120cm for a female. In Australia, Miniature Belted Galloways have only been recognised for inclusion in their own category in breed society Herd Books for around the last 20 years. Belties have a reputation for longevity - many live until 17 to 20 years of age. The Belties heavy, double hair coat means that heat loss is reduced, winter feed costs are significantly less and rain hardly penetrates in cold, wet weather. Beltie cows have about 4000 hairs to the square inch making the coat resistant to severe cold. Belties have, in fact, also been used on hot, dry stations with an annual rainfall as low as 150 mm and with their superior foraging ability, have thrived in these harsh, pastoral areas. Research in Europe has shown that Galloways will graze over the whole paddock which allows the grasses to compete with the weeds. They have the ability to forage under sparse conditions and as a result can be finished on pasture with only pasture hay or silage as a supplement. Belties are able to adapt to a variety of climatic conditions. They have good foraging abilities, ensuring that they thrive where other breeds fail. The coat is shed in hot weather, thus making the Beltie a highly adaptable and versatile breed for a variety of climatic conditions. The Belted Galloway is an extremely fertile breed, are regular breeders and are noted for their ability to produce a healthy, well nourished calf at weaning, even in the harshest of conditions. Some Belted Galloways have had two separate calves in one year. One cow in Australia has even produced three successive sets of twins. Belted Galloways are known for their ease of calving producing a live calf every year. Research completed by the Clay Animal Research Centre in Nebraska tested 11 breeds for their ability to give birth and rear their calf. The Galloways recorded the highest weaning percentage (95.5%) and the highest calf survival percentage (95.2%). The Galloways also had an outstandingly low incidence of calving difficulty (0.8%). The Galloway calf is very vigorous at birth which helps it to survive those crucial first few days of life. Belted Galloway breeders find that Belted Galloways possess a quiet disposition and are easily handled when managed properly. 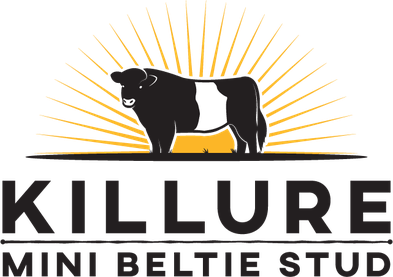 Belted Galloway Beef has been shown in a research study conducted at the University of Guelph (Ontario, Canada) - to have a total fat content of about 2%, an extremely low percentage. The same study showed that the Belted Galloway Beef tested only contained about 1% saturated fat. In addition, it showed that Belted Galloway beef had the same fat content as chicken and fish so fits in well with a healthy diet. Belted Galloway beef is exceptionally tender, full of flavour and juicy and was the winner of the 2003 Sydney Royal Show "Beef Taste Test". Data collected in the U.S. has shown that the beef dresses out at 60 - 62% of live weight making it a very profitable breed. Fullblood Galloway cattle have only registered fullblood Galloway cattle in their breeding history. At least five generations of registration papers are required before the cattle can be registered as fullbloods. Fullbloods must be the progeny of fullblood parents. Purebred Galloway cattle have one or more ancestors that are not fullblood Galloways. Purebreds or their progeny can never be registered as fullblood Galloways. Graded Galloway cattle have a breed other than Galloway less than five generations back in their breeding history (on at least one side of the breeding - sire or dam). For more general information on the Galloway and Miniature Galloway Breeds, including breed characteristics, see the Australian Galloway Association website. For more information about Belted and Miniature Belted Galloways visit the Australian Belted Galloway Association website.